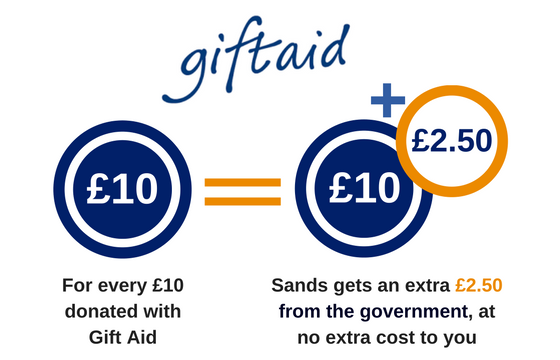 Boost your donation to Sands with Gift Aid by 25p for every £1 you donate - it won’t cost you a penny extra! Every gift you make to us - whatever its value - could be worth more at no extra cost to you just by choosing to Gift Aid it. HMRC will add an extra 25p to every £1 you give. However you choose to donate to Sands and whatever the amount - large or small, regular or one-off - Gift Aid allows us to raise more money to save babies' lives and support families when a baby dies. As long as you are UK Taxpayer, you can sign up to Gift Aid today, right now! Just fill out our online Gift Aid Declaration below, or download our printable version and return to us. It won't cost you anything to sign up to this scheme. Please fill out the form below to make your donation go further with Gift Aid. These details are required so we can claim Gift Aid on your behalf. By ticking the box I confirm that I want to Gift Aid my donations to Sands and any donations I make in the future or have made in the past 4 years to Sands, the stillbirth and neonatal death charity. I confirm I am a UK taxpayer and understand that if I pay less Income Tax and/or Capital Gains Tax than the amount of Gift Aid claimed on all my donations in that tax year it is my responsibility to pay any difference. Yes I would like Sands to claim Gift Aid on my donation(s) as indicated at the top of this form and understand that Sands will reclaim the tax I have paid on all my donations made in the last four years, and any future donations I may make. To qualify for Gift Aid, I understand I must pay as much UK income and/or capital gains tax as Sands (and any other organisation I may support) will reclaim in each tax year (6 April to 5 April), currently 25p for every £1 I donate. If I pay less it is my responsibility to pay back any difference. Gift Aid will be used to fund Sands’ general work.